HOTTEST NEW SALE $99.99 . . . for ADMINISTRATORS . . . FIELD TESTED . . . GREAT FOR CHARTER SCHOOLS . . . YES . . . You CAN Discipline those CRAZY Inner-City School Kids! No . . . Not tomorrow . . . BUT . . . RIGHT NOW! The ULTIMATE Tool for “INNER-CITY” . 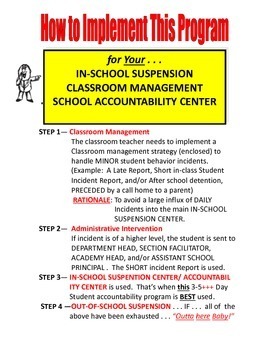 . . “URBAN” ADMINISTRATORS, “NEW” CLASSROOM TEACHERS, After School DETENTION, . . IN SCHOOL SUSPENSION . . . and Racial Sensitivity Training. THIS PROGRAM IS NOT DISCRIMINATORY . 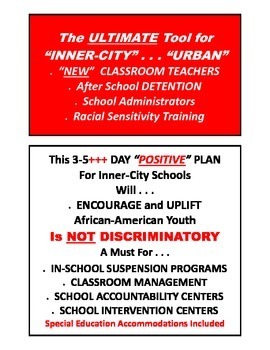 . . 3-5 DAYS of (WORKSHEETS) that promote a “POSITIVE” PLAN For Inner-City youth Will . . . ENCOURAGE and UPLIFT African-American Youth. IF YOU TEACH INNER-CITY . . . YOU WILL BE SORRY IF YOU DO NOT BUY THIS "ONE-OF-A-KIND' PROGRAM. 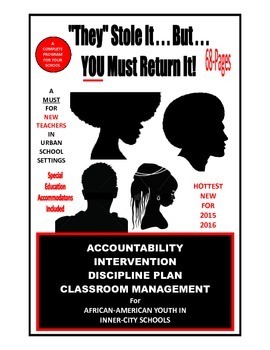 70+ pages of PURE WORKSHEETS and ACCOUNTABILITY INFORMATION . . . DEVELOPED BY A 32-year veteran teacher/administrator. ONLY $99.99 for a COMPLETE program that would cost a city school system THOUSANDS of $$$ dollars. INSTANT SET-UP . . . ALL YOU NEED IS AN ACCOUNTABILITY ROOM.